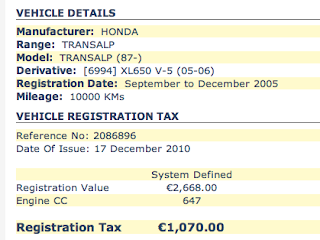 Importing an automobile or a motorcycle in Malta is pretty straightforward albeit expensive! Around thirty minutes ago I was looking around online for a Honda Transalp 650cc (2005 model) and managed to find one just under EUR2000. Fair deal! But then the shock came when I estimated the registration taxes (excluding admin fees of course!) - another EUR1070. For those who are wondering, you can calculate the registration tax from http://www.valuation.vehicleregistration.gov.mt/ .